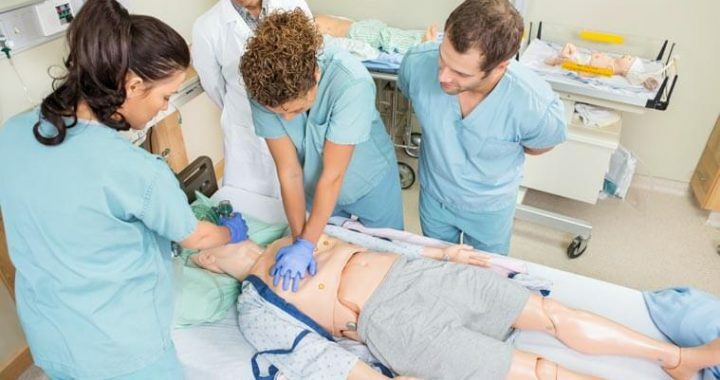 Healthcare Provider CPR Certification Overview: Learn CPR for Adults, Children, and Infants, treatment for Choking, Hypothermia and Dehydration, and how to use an Automated External Defibrillator (AED). Nobody wants to find themselves in the position of being near someone in need of rescue, but being powerless to help them. The idea that you may not be able to help loved ones or strangers in desperate need of medical help is a terrifying one. With this CPR certification training class, you have the opportunity to learn to save a life. The purpose of this Healthcare Provider CPR training class is to give people everything they need to learn life-saving skills online, improving access to this vital training. ‘Healthcare provider’ is a blanket term which we most commonly associate with doctors and nurses. Whilst doctors and nurses are often the most recognized healthcare providers, in reality, this term can apply to a wide range of different professions. Anybody who works somewhere where there is a risk of somebody becoming ill or injuring themselves could find themselves in the position of a healthcare provider. Security guards, park rangers, teachers and office managers may all find that they are the closest and most able person to give life-saving first aid to someone who has become unwell. Anybody could find themselves in the position of being the difference between someone living and dying. Whatever your profession, this class will give you the skills you need to be able to offer potentially life-saving assistance to loved ones or strangers in need. This is a training program which will teach you how to react in the case of medical emergencies and what you can do to give a person the best possible chance of survival when the medical professionals are able to take over. You’ll learn all of this in our clearly structured class, where we’ve set out all of the key information in a way which is clear, straightforward and easy-to-understand. This healthcare provider training program will teach you the theory behind CPR and how and when to perform it on somebody. CPR is an abbreviation of the medical term Cardiopulmonary resuscitation, and comprises a combination of chest compressions and artificially introducing air into the patient’s lungs. CPR is usually a medical technique used when a patient stops breathing in order to preserve life. It is performed in order to keep blood pumping around the body so that oxygen can continue to circulate and keep the brain and organs functioning. People are often surprised at how easy it is to learn CPR, despite it being one of the most crucial medical techniques that anyone can learn. It is a vital piece of knowledge and understanding which everybody can and should feel comfortable performing. It is vital for first aiders, emergency responders and medical professionals, but it is also a vital skill for anyone serving as a healthcare provider. These simple and basic skills can and do save lives on a daily basis, and the more people that have the skills, the more lives that could potentially be saved. Anybody could say that they have been trained in CPR, but with this class, you will be given a certification upon successful completion. This certificate will serve as a useful reminder of your skills, but it can also serve as a piece of evidence on applications for jobs or promotions. The certificate will stand a proof that you have taken the time to learn these vital skills and that you are willing to put them into practice if or when you are required to do so. If you are looking to pursue a career as an emergency responder or paramedic, this class would be a great addition to your portfolio, but these are not the only careers which could be aided by completing CPR training. Healthcare Provider CPR training could benefit anyone who is responsible for the safety of others. Lifeguards, park rangers, teachers and cabin crew members and so many more professions could all increase the likelihood of you being near to a person in need to urgent medical help. Healthcare CPR training should be accessible to all, and our pricing reflects that. At just $17.95 $12.95, this class is priced to be affordable for everyone. We are able to offer such a low rate because all of our training materials are hosted online. We offer professional-quality class content and information, but without the overheads of having to hire a trainer and pay for their time and a space in which to perform the training. Not only is the cost extremely low, but the class has been designed to fit around you and your schedule. Follow the class in your own time, whenever you have a few spare hours to complete it. It takes less than a day to complete the training, and your certificate will then be posted to you shortly afterwards. This is a speedy class which runs at a fast place. Taking the class online by yourself means that you can work as quickly as you’d like to, and don’t have to be slowed down by the pace of a group. You can have a working knowledge of CPR enough to potentially save someone’s life in just 20 minutes. Most CPR classes wouldn’t have finished their introductions in this time! You can take the class straight away when you sign up. You don’t need to wait for a trainer to be available and a convenient date for multiple people to attend. Instead you can just log in and access the class immediately. The class is divided into seven topics, each of which is given its own module. These modules are designed to break up the training into manageable chunks and to help you to learn how to successfully use CPR in a way which makes sense and that you will be able to remember when you need to. You’ll learn about the differences between performing CPR on adults and children of different ages, adapting your skills as necessary to the situation at hand. The Healthcare Provider CPR training class will focus on the basics of CPR, but what you will learn will stretch much beyond this. CPR is a medical technique which has been used for a long time, despite advances in medical technology. After teaching you about the techniques of CPR, the class goes onto explain about defibrillators; where you might find them and how you go about using them. Nowadays, many public spaces and workplaces will have access to a nearby AED (automated external defibrillator). These defibrillators are designed for use by non-medical professionals to be able to administer life-saving support to patients before trained doctors or paramedics are able to arrive. At the end of the healthcare provider CPR class, you will be asked to take an test in order to demonstrate that you have acquired the skills necessary to successfully perform CPR. The test will be based on the information provided throughout the class. You can complete the test right away or wait a while, it’s completely up to you. There is no limit to the amount of tries you can have before you pass the test, so there is no pressure to pass it first time. The pass score for the test is 70%, and once you reach this score you will be awarded your certification. The test features a variety of questions taken from information given in all seven modules of the class. This means that you will be expected to remember details from the start of the class, so it is recommended that you pay attention and take notes from the very beginning. You will be tested on a variety of different scenarios which may come about during the working day or when you are out and about. Healthcare CPR is simple to learn, but it is also easy to forget. The guidelines on medical best practice also change from time to time, so it is important to keep up to date with the latest teachings. Recertification is therefore an important part of CPR training. You should be prepared to take a refresher class every few years in order to stay up-to-date and qualified in performing CPR. We are proud to offer recertification to people who have already completed the healthcare provider CPR certificate once. Simply take the class again in order to receive a new certificate with an updated pass date. Why train with us? The CPR Heart Center is a well-respected platform which is highly regarded for its CPR training. Not only will our training offer you accessible and affordable training in CPR, but a qualification from us will look great on your CV. Many organizations recognize and respect our training programs. Why does Healthcare Provider CPR Certification Matter at the End of the Day? A Healthcare Provider CPR certificate is a great step forward to impress future employers. It is a sign of interest and dedication to emergency medical assistance as well as a clear demonstration of your willingness to help others. If you are looking for a career in the medical services, this could the what sets you apart from other applicants. For those who are already working in a medical profession, or who have previously been trained in performing CPR, this certificate will work as a perfect refresher of your existing skills. Earn Your Healthcare CPR Certification Today!